For quite a few years, I have been reading and re-reading Cheng Tzu’s Thirteen Treatises,1 written by my first T’ai-Chi teacher, Cheng Man-ch’ing (1900–1975). I consider most of this book to be very clear and filled with valuable information. However, even though my Ph.D. is in physics, I found Treatise 7, entitled “Strength and Physics,” very hard to understand. This essay ends with Prof. Cheng saying, “This treatise reveals the secret of many generations of T’ai Chi Ch’uan masters. I hope the practitioner will pay special attention to this!” He evidently considered this essay, which deals in part with neutralization, to be very important and chose to use physics as the main expository tool. I decided that the only way for me to satisfactorily understand this important subject matter was to recast parts of it into my own words. That endeavor bore fruit and also revealed a basic error in the section on the physics of T’ai Chi in Yearning K. Chen’s book, Tai-Chi Chuan: Its Effects and Practical Applications.2 There, Chen considers incoming forces, displaced by varying amounts from the defender’s center and analyzes the force required to deflect each one. The error in Chen’s treatment is that there can be no incoming force by the opponent without an equal-and-opposite reaction force (forces always come in pairs). Thus, the reaction force, which would be exerted by the defender, would be exactly as large as the incoming force. But the main idea is for the defender to exert minimal force in dealing with a powerful attack. Nevertheless, Y. K. Chen’s useful method of analysis will be employed in Section 6 to treat parts of Treatise 7—here using the appropriate quantity, incoming momentum, instead of incoming force. 1. Roundness and Expansiveness. Every point of the outer surface of the body (trunk and limbs) must have an expansive, round quality and feel to the opponent like the surface of an impenetrable sphere. The nature of a sphere is that its surface at each point is perpendicular to the radius drawn to that point. Thus, when an opponent makes contact with any part of your body, you must orient its surface at that point to be perpendicular to a line from your center to that point. Moreover, when any part of your	body exerts force on an opponent, the direction of that force should always be radially outward from the center of your body. The reason for these conditions will be explained in sections 6 and 7. 2. Triangles. To make the body into a sphere is an impossible task. However, it is important to realize that the opponent has contacted us only at certain points. Thus, it is sufficient to simulate a spherical shape only at the points of contact. 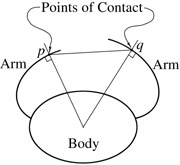 As mentioned, any force you exert at a point of contact must be outward from your center to that point, and the surface of your body at each point of contact must be perpendicular to the line joining your center and that point (see Fig. 1). For two points of contact, there will be two lines, each joining your center with a point of contact. For three points, there will be three lines, and so on. If a line is drawn joining any two points of contact, a triangle is formed with its apex at the body’s center. As the body rotates about its center, so does the triangle. Fig. 1. A depiction of the body, with arms used to intercept an opponent’s force. The arms are drawn as arcs because, to the opponent, each point of contact feels like it is on the surface of an impenetrable sphere. Note: Fig. 1, which is drawn two-dimensionally, only shows rotations of each arm about an axis perpendicular to the page. In actual application of the principle of roundness and expansiveness just discussed, the arm must be also appropriately rotated about its axis. Aligning the surfaces both ways is necessary for deflecting the opponent’s attack in any direction. 3. Newton’s Third Law. It is impossible for an object to exert force on another object without that object exerting a force back. According to Newton’s third law, if object A exerts a force on object B, then B exerts an equal and opposite force back on A (see Fig. 2). These two forces are called an action and reaction pair. Thus, when someone exerts force on your body with his hand, before you even do anything, your body automatically exerts a force back on his hand that is exactly equal in magnitude and opposite in direction to the force his hand exerts on your body. Similarly, when you place your hand on his body, now another two forces come into play. One is the force that you are exerting on his body with your hand. The other is the equal and opposite force exerted on your hand by his body. Conclusion: By controlling the force you exert on the opponent, you automatically control his force on you. 4. “A Force of 1,000 Pounds can be deflected with a Force of Four Ounces.” What is meant by this oft-quoted saying is that a very powerful attack can be deflected with a very small force. How this defense can occur will be analyzed in the next sections. However, the wording of this saying leads to misunderstanding in explanations using physics because it does not make sense in terms of Newton’s third law. According to that law, if there is a force of 1,000 pounds, it must be exerted on something (or somebody) that (or who) exerts 1,000 pounds back. Here, the force that the opponent exerts would be on you, and you of course would exert an equal and opposite force back on him. But the main idea is not to interact with the opponent in a way that can cause injury to yourself. The goal is to exert minimal force on the opponent and not interfere with his motion—only redirecting his attack to clear your body. Using minimal force on the opponent means that you don’t need a lot of strength. It also means that he will, by Newton’s third law, use minimum force on you, which lessens the chance that you will be injured. Not interfering with the opponent’s motion means that he will be more likely to over-extend and lose his balance. Then, he will either fall or pull back. If he pulls back, you can easily push or hit him. Maybe the opponent intends to exert 1,000 pounds of force on you, but he can’t because of the manner in which you interact with him. It is simply incorrect for an attack to be described in terms of an opponent’s “incoming force,” and, therefore, it is incorrect to analyze the neutralization in such terms. 5. Shifting off the Line of the Attack. Before analyzing the turning aspect of neutralization, we consider the effects of shifting the weight when in a 70-30 stance. In fixed-stance push-hands practice, the only way to move off the line is to shift your weight (in moving-stance push-hands or in combat, there is also the option of stepping). When 70% of your weight is on your forward foot, your center of mass (c.m.) is over the line joining the centers of your feet and 70% of the way from the center of your rear foot to that of your front foot (Fig. 3). When your weight shifts to 100% on your rear foot, your c.m. moves along the line joining the centers of your feet to a location directly over the center of your rear foot. It can be seen from Fig. 3 that shifting your weight from 70% on your forward leg to 100% on your rear leg corresponds to a sideways shifting of your body a distance s, which, measured from Fig. 3, is about 80% of a shoulder width w.
Fig. 3. When the weight shifts from 70% on the forward foot to 100% on the rear foot, the center of mass c of the body shifts to a location over the center of the rear foot, corresponding to a sideways movement a distance s of approximately 80% of a shoulder width w.
Conclusion: When there is a committed attack to your center, just by your shifting backward in a 70-30 stance, you automatically move your center to the side an amount that prevents the attack from reaching your body. 6. Neutralizing. In general, the force exerted on your body by an attacking opponent can be considered to have two components: (a) a radial component, directly to your center, and (b) a tangential component exerted by friction. Because the opponent should be made to feel that he is contacting a sphere that is able to rotate freely, friction is limited to only what causes the sphere (your body) to rotate. The more freely rotating your body is, the less friction is needed. Thus, the main force exerted on your body by the opponent will be toward your center even if the line of the attack is not toward your center (Fig. 4). By Newton’s third law, the force exerted on the opponent by your body will be exactly equal and opposite to his force on you. Because the opponent’s force will be directed toward your center, by Newton’s third law, your force on him will be radially outward from your center. Fig. 4. The force of the attack on your body has two mutually perpendicular components: One is radially into your center, and the other is tangential to the (spherical) surface of your body at the point of contact. The tangential component is not shown here because it is negligibly small if your body is free to rotate. In Figure 4, the line of attack is off center—not because that is the way the opponent wants it to be but because you moved it off the line of the attack by shifting or stepping. If the opponent’s line of attack is directly toward your center and you allow it to remain that way, the force he exerts on you can only be neutralized by an equal and opposite force outward from your center and back to him. Countering such a strong attack that way could require more strength than you have, resulting in your being injured. Even if you were strong enough, mounting such a defense would be ineffective because it would interfere with and stop the opponent’s motion. In the words of Prof. Cheng, “An opponent charges us with a force that rushes like a mighty river. What is our defense? If we attempt to confront this force head on, it will be as useless as attempting to melt iron.”4 In T’ai Chi, the goal is to use minimal force so as not to interfere with the opponent’s motion, which requires moving one’s center off the line of the attack either by shifting (see Fig. 3) or stepping. Then the neutralizing force will be exerted at an angle to the incoming momentum. 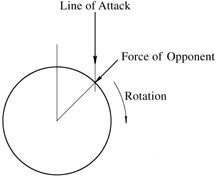 The farther your center is off the line of the attack, (a) the closer to 90° the angle between the line of the attack and the line from the center to the point of contact, (b) the smaller the deflecting force needed to neutralize the attack, and (c) the less the attacker’s momentum will be changed in magnitude and direction. A rigorous analysis would take into account that the neutralizing force changes in direction as the body turns. The analysis of the action of such a force requires the use of vector calculus, which is beyond the scope of this article. We will, therefore, assume a neutralizing force that is constant in direction. The error caused by this simplification will not qualitatively affect the conclusions reached. Because the direction of the neutralizing force is the main factor in determining its magnitude and effectiveness, our analysis must utilize quantities that have direction (thereby ruling out treating energy, which is non-directional). Momentum and force are quantities that have both magnitude and direction. Such quantities are called vectors. Whereas it is inappropriate to talk about an incoming force, we do need to treat the defender’s force because that force must be minimized. Thus, we need to analyze the attack in terms of the attacker’s momentum and the defender’s force. Note: Boldface type will be used to represent a vector quantity (e.g., F), and an italic letter will be used to represent the magnitude of a vector quantity (e.g., F). Because our analysis requires adding vectors, the method of doing so is explained next. Two vectors A and B can be added to obtain a sum C = A + B. The sum C is the single vector that has the same effect as that of A and B acting together. The method used to add vectors is best illustrated by treating displacement, a more-familiar vector quantity. Displacement is a motion of a given distance in a given direction such as walking one mile east. Two displacements A and B are added by first drawing each of the vectors A and B as directed line segments in their respective directions such that their lengths are proportional to their magnitudes. Then the tail of B is placed on the head of A. The vector C is then the directed line segment from the tail of A to the head of B. For example, assume that A represents a displacement of 3 miles in an easterly direction, and B represents a displacement of 4 miles in a northerly direction. Then, to show the addition A + B = C, we can draw A to be 1.5 inches long, to the right, and B to be 2 inches long, upward (Fig. 5). Thus, the scale used is 1 inch = 2 miles (which may not reproduce on every computer screen). Fig. 5. 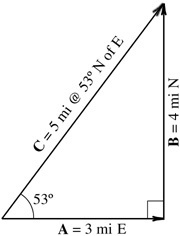 The addition of two vectors A = 3 mi E and B = 4 mi N to obtain the vector C = 5 mi at an angle of 53° N of E. A scale of 1 inch = 2 miles was used. Note that, by the Pythagorean theorem, 32 + 42 = 52, and the angle whose tangent is 4/3 is 53°. That is, instead of walking 3 miles east and then 4 miles north, you can get to the same destination by walking 5 miles in a direction 53° north of east. Now that the rule for adding vectors has been explained, we are in a position to use vector addition to analyze the deflection of an incoming attack that is displaced by various amounts from a line to the defender’s center. Let us assume that the opponent’s initial momentum is Pi (momentum is defined as mass times velocity) and that the opponent’s final momentum is Pf. We will depict the defender’s body as a circle (which is the cross section of a sphere). There is a principle in physics that the change in momentum Pf – Pi equals the average force F multiplied by the time t during which F acts. From Equation 1, above, it can be seen that the force used for deflecting the opponent’s incoming momentum is minimized (the legendary use of four ounces) if the time to do it is prolonged and if the opponent’s change in momentum Pf – Pi is kept small (only a small sideways deflection, just large enough to cause the attack to clear your body). Pf = Pi + F • t .
See Fig. 6 for the application of the above vector equation for the force required for deflecting incoming momentum displaced different amounts from the center of the defender. Fig. 6. Left: Pi is radially inward. Therefore F • t is equal and opposite to Pi, and Pf is zero. Middle: Pi is directed at a 30° angle to a line drawn from the center to the point of contact. Therefore the line of F • t makes a 30° angle to that of Pi. Pf is tangent to the circle and smaller in magnitude than Pi, and the magnitude of F • t is much smaller than that of Pi. 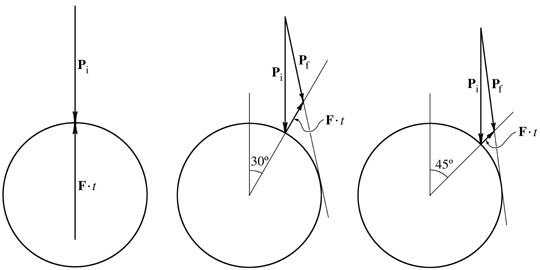 Right: Pi is directed at a 45° angle to the radius. Therefore the line of F • t makes a 45° angle to that of Pi. Pf is tangent to the circle and slightly smaller in magnitude than Pi, and the magnitude of F • t is even smaller than when Pi is directed at a 30° angle to the radius. Conclusion: As the angle between Pi and the radius approaches 90°, the magnitude of F • t approaches zero, and Pf approaches Pi. Thus, the more you can move your center off the line of your opponent’s attack, the smaller the deflecting force needed and the smaller the change in the opponent’s momentum. The result is that you are not harmed, and the opponent’s motion is almost unchanged, which disrupts his balance. It is important that, when shifting backward during push-hands practice, you move your receiving wrist straight back along the line of the attack as you shift backward. If you make the mistake of keeping your wrist on your center when moving backward, your wrist will move with your body laterally toward the side of your rear leg, which will draw your partner directly into your center. 7. The Reason why Your Deflecting Force Should be Radially Outward from Your Center. It can now be explained why it is necessary to exert force radially out from your center and to maintain the surface of your body perpendicular to the line from your center to the opponent’s point of contact. Imagine that, instead of exerting force on your opponent radially out from your center, you were to add a tangential component of force toward the opponent. From the middle diagram in Fig. 6, it can be seen that you would then interact with the opponent’s incoming momentum in such a way that he no longer would feel as though he is contacting a freely rotating sphere but one which requires force to move. That would likely alert the opponent, who would change his attack. Next, imagine that instead of exerting force on your opponent radially outward from your center, you were to add a tangential component of force away from the opponent. From the middle diagram in Fig. 6, it can be seen that the effect would be to interact with the opponent’s incoming momentum in such a way that he no longer feels as though he is contacting a freely rotating sphere but one that turns faster than it should and pulls him. Whereas pulling the opponent is a valuable tactic, it can only be done effectively after the opponent’s attack is neutralized. Again, the opponent would likely be alerted by this inconsistent rotational rate and change his attack. Finally, assume that the deflecting force were to have a component perpendicular to the plane of the incoming force and the line joining your center to the point of contact (perpendicular to the plane of Fig. 6). Aside from the fact that this scenario would seem to serve no function, it would require a movement of your body in a direction perpendicular to that of the attack, which would be unnatural and alert the opponent to make a change. Thus it can be seen that the success of the neutralization requires that you exert force radially outward from your center. Adding a component of force in any other direction is wasteful and counterproductive. Next, consider what happens when the surface presented to the opponent is not perpendicular to the line from your center to that surface. In this case, the surface automatically exerts a component of force that is not radially outward from your center. The only way to lessen this force is to withdraw the surface rather than turn your body. The result is that the opponent can follow the change and end up catching you, in which case, you have not neutralized but unsuccessfully run away. This analysis illustrates the importance of keeping the surface of your body, at the point of contact with the opponent, perpendicular to the line drawn from your center to that point. 8. Spheres Everywhere. I do not know if Prof. Cheng would agree that the center of the sphere can be at a place other than the center of your body. 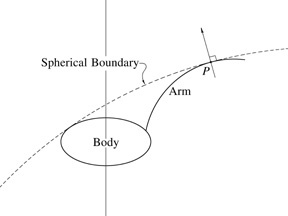 However, I learned from one of my teachers, Sam Chin Fan-siong, that the center of the spherical surface at the point of contact with the opponent does not even have to be within your body—it can be anywhere as long as (a) your body is inside the extension of the spherical surface at the contact point and (b) the force you exert is perpendicularly outward from that surface. One of Chin’s favorite defensive stances, “The Beggar’s Stance,” which illustrates this concept, involves facing the opponent with arms outstretched to create convex surfaces (see Figs. 7 and 8). Employing a sphere whose center is not that of your body does not negate any of the above analyses. Simply substitute the words center of the spherical surface for the words center of your body in the above analyses. 9. Arms as Rollers. To my knowledge, Prof. Cheng did not discuss this concept in Treatise 7, but it seems to be applicable to the concepts therein. Throughout the T’ai-Chi empty-hand form, there are rotations of the arms in alternating directions. One application of these rotations is snaking around the opponent’s arms to penetrate inside his space as in “Parting the Wild Horse’s Mane.” Another application of these rotations is rolling the opponent away from your center as in “White Crane Spreads Wings.” The rolling action is a way of creating more movement than just turning your body. In push-hands practice, your partner advances with the palm of his hand on the back of your wrist. Your forearm is parallel to the ground, and his force moves your body back. Because you are in a 70-30 stance (say with your right foot forward), as you move backward, there is also a sideways component of your motion, toward the left. That is, your center of mass moves along the line joining the centers of your two feet, from 70% of the way from your rear to your front leg, to directly over your rear leg. Therefore, as you move backward, you are automatically moving off the line of the attack (see Fig. 3). For a 70-30 stance it is important that, after you have moved back a fraction of the way, you turn your body toward the forward foot, which has the effect of deflecting the attack and allowing your opponent to move farther than he expected. it also leads your partner into a double-weighted position and makes his other hand useless. during the last portion of the neutralization, your elbow lowers, and your wrist rotates to palm-outward. this arm action draws the attack farther along its line and farther from your body than would occur from simply turning your body. it is also stronger and has the potential for pulling your partner. 10. Attacking. The attack must be directly from your center to that of the opponent. If the attack is not from your center, the reaction to it will cause your body to rotate, thereby dissipating the energy of the attack. Moreover, if the attack is not to the center of the opponent, it will cause the opponent’s body to rotate, thereby neutralizing the force of the attack. It is very important to establish a line from your center to that of the opponent before attacking. 11. Leverage. The lever is a rigid rod, straight or bent, that can rotate about a fixed point called a fulcrum. Force is applied to the input end of the lever, and force is exerted by the opposite (output) end. By constraining a line in the body to be unchanging except for its rotation about a fulcrum, we can create a lever in any direction in three dimensional space. It should be noted that the rod can have any shape—it need not be a straight line—as long as it is resilient and does not distort under the stress of its action. Also, a combination of levers can be arranged so that the output of one can act on the input end of the next. Such a combination of levers is called a compound lever. I learned the following exercise from one of my main teachers, Harvey I. Sober. In this exercise, the fulcrum of the lever is the point of contact of your partner on your body, the input end of the fulcrum is the hip joint of the leg that will produce force and movement, and the output end of the lever is the point of contact of your body on your partner. You and your partner face each other in a harmonious 70-30 stance with our right feet forward. Your partner tries to move you by placing his right hand on your chest, on your left side. You will need to make that point the fulcrum, and you can only turn your body about that point but not move it. You place your right hand on your partner’s chest, on his left side. The lever will be a line from one of your hip joints, through your partner’s hand on your chest, to your hand on his chest. As your partner exerts force on your chest, sink your weight and expand, thereby solidifying your body so that it does not bend under any force that your partner exerts. At the same time exert a force on his chest, corresponding to his force on you, in such a direction that the reaction to his force on you plus the force you exert on him with your right hand add vectorially to go to his center and direction of weakness. Then feel that line of action from your hip joint, to his hand (the fulcrum), to your hand. Then straighten your rear leg, which causes the input end of the lever to move. At the same time the output end will move correspondingly. The main idea is not to use a lot of force with your hand but rather move your partner in a lever-like response to the force he exerts on you with his hand. 12. In Conclusion. When I studied with Cheng Man-ch’ing in the early 1970s, he greatly emphasized the importance of neutralization in push-hands practice. He felt that we should not push each other with any power until we learned how to neutralize. That way, the person being pushed would have a better chance of success in learning to neutralize. At that time, few (if any) of us were able to neutralize. It was not until a decade after Prof. Cheng’s death that his Thirteen Treatises, written in Chinese in 1946, was translated into English. Had that book been available in English when Prof. Cheng was alive, I am sure that we would have had many questions for him about Treatise 7 and, as a result, might have made much faster progress in learning to neutralize. It is interesting that two native Chinese people who were famous in the T’ai-Chi world—Cheng Man-ch’ing, born over a century ago, and Yearning K. Chen—felt that physics was a useful tool in explaining neutralization. Practicing intuitively for many years in an effort to master an art is certainly of great value. However, using every tool—in this case physics—cannot but hasten mastery for some and make the difference between mastery and partial expertise for others. 1Cheng Man-ch’ing, Cheng Tzu’s Thirteen Treatises on T’ai Chi Ch’uan, Translated by Benjamin Pang Jen Lo and Martin Inn, North Atlantic Books, Berkeley, CA, 1985, Ch. 7. 2Yearning K. Chen, Tai-Chi Chuan: Its Effects and Practical Applications, New Castle Publishing Co., Inc., P.O. Box 7589, Van Nuys, CA 91409, 1979, pp. 15–17. 3From Robert Chuckrow, Tai Chi Dynamics, YMAA Publication Center, Inc., PO Box 480, Wolfeboro NH 03894, 2008, p. 49. 4Cheng Man-ch’ing, Master Cheng’s Thirteen Chapters on T’ai-Chi Ch’uan, Translated by Prof. Douglas Wile, Sweet Ch’i Press, Brooklyn, NY, 1982, p. 31. 5From Robert Chuckrow, Tai Chi Dynamics, p. 34. 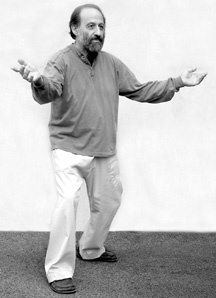 6From Robert Chuckrow, Tai Chi Dynamics, p. 35.